Natural Forest Practice - Why are you making glades? Left – Newly formed glade with shaft of sunlight reaching the woodland floor. Why are you making glades? Glades are holes punched in the forest canopy to let light through and are the classic example of nature’s intervention to rejuvenate the forest. A large tree blows over (perhaps in a gale) and the woodland awakens - birds sing, seedling trees compete for light, forest flowers bloom, insects dance, ferns flourish, and so on. Glades are thus dynamic, each one is different, never static, always closing over as new ones form. Without glades the forest becomes dark, quiet and the ground bare. We must observe these carefully and learn how nature rejuvenates the forest. * It’s important that glades are kept small for they can always be enlarged. Too big (a clearing) lets in too much light and air, the humidity drops, ferns die back, insect numbers are reduced and the brambles grow abundantly. This fortunately, helps protect the soil from drying out. Small glades produce a light covering of brambles that are nature’s plastic tree guard protecting seedlings that germinate. * Glades introduce a rich diversity creating a forest in miniature for insects, ferns, flowers, berries and more. * They present an opportunity to diversify the larger forest trees such as oak, ash and fir, by encouraging smaller species that would otherwise be shaded out; for example birch, cherry, crab apple, thorn and yew. 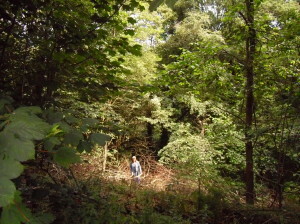 * In summer check that shafts of sunlight reach the woodland floor and if not identify which trees are blocking the light. * Yes, it’s much easier to fell a tree, but the wood is then all on the forest floor whereas there is always great need for standing decaying trunks. In the natural forest nature requires something like 26 standing butts to the acre to be healthy. * A rolling programme of glade creation is recommended, a few year on year, contributing to the moth eaten blanket. Thus they make a major contribution to the richness and diversity of the woodland. 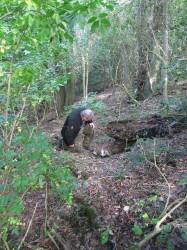 Left – A badger sett exposed to view by the open woodland.